We’ve been bringing the signs of spring to your attention—the greening of nature, the running of ground water, the metaphors available in the hearts of the Easter lilies. But this morning I noticed another sure sign of spring in my university town: the springing up of couches on the curbside. It’s the time of year that young folks are clearing out their student digs. Broken computer desks, three-legged chairs, bags of trash bound for landfill pile up along the curbs, even in the most up-scale residential areas as basement rooms and granny flats empty out their winter student inhabitants. But mostly, it’s couches! Occasionally I spot a piece of furniture that looks better than my own, which tends to bear the scars of a rather undisciplined old kitty. But mostly they’re just shabby. Sometimes they’re “footless” or missing their seat cushions. It’s been raining every day, so they don’t sit there long without becoming quite water-logged I’m sure. I’ve been meditating a bit on this particular sign of spring. What does it mean, this proliferation of abandoned couches? 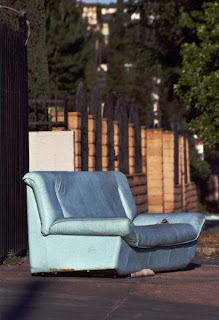 For every couch there is somewhere a young person (most likely) in a major life transition. They have no more need for this shabby couch; it’s time to move on to the next stage. Time to find a job, or move back home and keep looking. Apartments get rented, and then given up when lay-offs happen. Jobs are more temporary than permanent. Some will go back to school; others will try a new community. Relationships end and change or morph into something different. Where are your young adults? Have you sent them away to school or a new job or post-graduate study? Do you know what became of that path? Is the support structure that was once solid still stable or secure? Or have you lost track of them? Is someone waiting at that cross-country destination they’ve identified? All these couches are making me ask those questions about the young adults I know and care about. For every couch there is a story. Just this morning I heard of a couple of folks whose stories I used to know but have lost track of. Maybe one is working shift work, having taken on a second job that makes it impossible for her to come out to the activity she used to enjoy. Another young man is thinking about changing cities and wants to make a church contact. But who will that be? Will the new congregation welcome him? Can he find a job there that will give him some security so he can settle in and feel community again? Or will he need to toss his couch and move on? Just some more questions for us to ponder. What are your thoughts about this particular “sign of spring”? But the "couch phenomenon" predates the current bb epidemic I believe. And if the windows are open, i guess we just all wave back to each other. Spring is on its way.